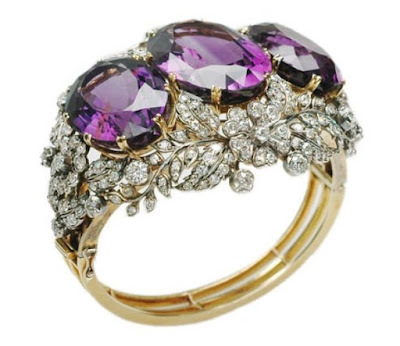 There was also an amethyst bracelet, a hinged bangle with three large oval amethysts and approximately 10 carats of diamonds in a leaf and flower design, set in silver and gold and made around 1890. This piece came up for sale in 2009. The bracelet belonged to Mary Russell, Duchess of Bedford (1865-1937), the wife of the 11th Duke. She was a fascinating figure, a vocal suffragette and noted ornithologist who founded four hospitals and decided to take up flying at the age of 63. That passion for aviation ultimately led to her death in a plane crash at sea in 1937. 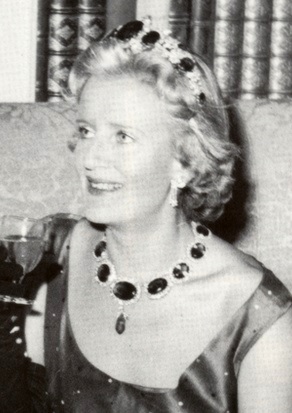 The tiara is still with the family. It was displayed earlier this year alongside their larger tiara, the Bedford Floral Tiara, in an exhibition for Chaumet in Beijing. The Bedford Floral Tiara is a Fossin design commissioned in 1830 from Chaumet. Both can be seen glittering away at the exhibition in the Instagram video above. 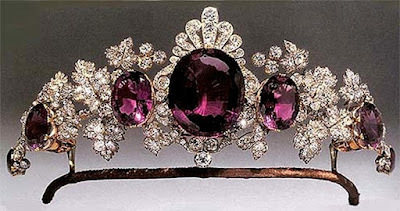 Good amethyst tiaras seem hard to come by (unfortunately, says this ardent fan), but I think this one cracks the code of a great amethyst tiara design. The purple stones are large, they look good enough to eat, and they're nicely complemented by the floral diamond motifs. As a matter of fact, it may just be my current amethyst favorite. Is this an amethyst fave for you, too?